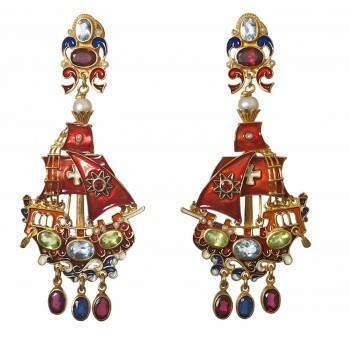 GALLEON - Earrings with blue topaz, garnet, peridot and sapphire. GALLEON - Earrings in gold plated silver 925/1000 with 18 kt pin. Made with enamel in cloisonné technique, with blue topaz, garnet, peridot and sapphire.